Breaking down on the side of the road can throw anyone into a panic. Whether you were in a fender bender or a part of your car has failed, a monkey wrench is thrown into your daily schedule and worries about insurance and repair costs loom in the back of your mind, making matters even worse. Although you’ll understandably have one million thoughts sprinting through your mind, it’s vital you take the proper steps in a roadside emergency to maintain your safety. If you feel the car breaking down, or if you’ve been in a minor accident and can still move the vehicle, get to the safest location possible. This is typically a shoulder on the highway or the side of the street. You want to be out of the way of traffic. To ensure that you and everyone around you stay safe, you’ll want to make sure that your vehicle is easily visible from the side of the road. This may mean turning on your hazard lights or using road flares. If possible, try not to leave your vehicle parked at the curve of the road where an exiting vehicle may not see you until it’s too late. If you can’t drive your car, your next step should be to call for a tow to a nearby auto repair or auto body shop. If you’re in the tri-state area, Bob and Joe’s Towing will tow your car to any shop in the country. 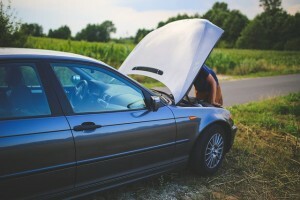 As part of our 24 hour roadside assistance service, we can also provide a jump start or a can of gasoline. If you’re in a rush, we’ll even bring a loaner vehicle right to you so you can continue on your trip. While waiting for help to arrive, be sure to grab any items in the car you may need while it’s being repaired. This may include keys, work documents, clothing, or a GPS.